In the early 1930s the Eastern Slope region of New Hampshire was seeing the same growing interest in skiing as Stowe. And also similar to Stowe, skiing accidents would inspire organizations that would stand the test of time. Carroll Reed worked for the John Hancock Insurance Company in Boston. He got hooked on skiing thanks to weekend trips to the White Mountains. In 1933 he and some friends founded the White Mountain Ski Runners ski club (aka the “White Mules”) which still exists today. The members would stay in Jackson, New Hampshire and ski on CCC-built trails in Pinkham Notch. On April 21, 1934, Reed was taking a late afternoon run down the Wildcat Trail. The spring corn snow was beginning to set-up making for a faster descent than planned. Reed skied out of control, hit a tree, and broke his back resulting in partial paralysis of his lower body. Fellow skiers improvised a rescue and got him to the Memorial Hospital in North Conway that night. A Massachusetts neurosurgeon was called in and operated on Reed. Reed would be in the hospital for nineteen weeks during which time feeling gradually returned to his lower body. It would be another year-and-a-half before Reed could resume normal activity. During his long recuperation Reed had plenty of time to read and make plans. He read about the Hannes Schneider ski school in St. Anton, Austria, and its organized approach to teaching skiing. Reed thought that it would be good to start a ski school in Jackson so that people could learn to ski and avoid accidents like his. No more John Hancock, Carroll Reed was about to become a skiing entrepreneur. 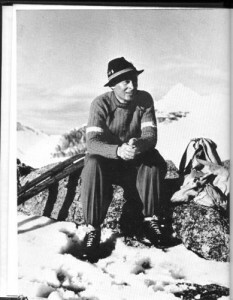 Carroll Reed started the Eastern Slope Ski School in 1936. To help finance his efforts he solicited $1 per room from local inn owners in exchange for lesson discounts for their guests. He arranged for Austrian Benno Rybizka, a disciple of Hannes Schneider, to come to the United States and head up the school. Submitting his answer from Facebook, Marc Cousineau was the first to identify Carroll Reed. Stowe Host Bob Simeone who spent his early years skiing in North Conway and Jackson provided the correct answer as well. Back to 1936: Rybizka arrived in Jackson in December and began training some local young men to be instructors. The winter of 1936-37 was short on snow so in Reed’s words they were “skiing on light snow and sheep manure.” However the ski school still gave 6000 lessons in that first season. The local innkeepers were delighted with the added business the ski school had brought them. For the next season, the Eastern Slope Ski School expanded to a second location. Harvey Dow Gibson was starting the Cranmore ski area in North Conway and paid Reed to open a ski school there. Between the two locations Reed’s ski schools gave 12,000 lessons that winter. 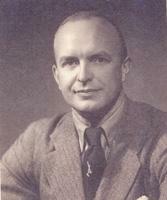 In the summer of 1938 Harvey Dow Gibson began negotiations that would bring Hannes Schneider to the United States and North Conway. Schneider was in a Nazi prison at the time. Part of Gibson’s plan was to buy Reed’s ski school so he could give it to Schneider to run. Reed was surprised by the offer, but decided it would be in everyone’s best interest to sell. Plus Reed would be able to concentrate on his ski shop and clothing business. 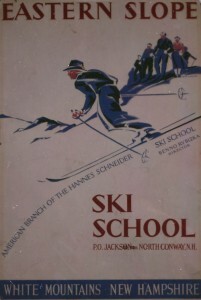 On February 11, 1939 Hannes Schneider arrived in North Conway to take over the Eastern Slope Ski School which would be renamed the Hannes Schneider Ski School.